Maxime-Kalifa Sanou is all about sports and shows exemplary discipline. A former coach of the Rouge et Or at the Université Laval, an excellent basketball player and an accomplished boxer, Maxime has been an Admission and Discharge Officer at Donnaconna Institution since September 2016. Prior to this position, he worked there as a correctional officer for over eight years. He told me enthusiastically of his pride in representing his country and organization in the Police and Fire Games. His first time competing as an athlete/peace officer was in 2015 at the World Police and Fire Games which took place in Fairfax, USA. When he arrived at the Games, he quickly grasped the magnitude and popularity of this international event. He explains that the procession in the stadium of 10,000 athletes from over sixty different countries during the opening ceremony was one of the greatest moments of his athletic career. During those Games, Maxime was part of a basketball team comprised of police officers and correctional officers from the Québec area. The team competed against other teams from the United States, Israel and China, and lost the bronze medal game to Mexico. His second time competing was in the first North American Police and Fire Games that were held in Drummondville, Quebec, in July 2016. For the first time, Maxime competed in two sports, boxing and basketball. He won the gold medal in the 75 kg open class (25 fights or more), but his basketball team was eliminated before the medal round. His most recent major sporting event took place in August 2017 in Los Angeles, California. 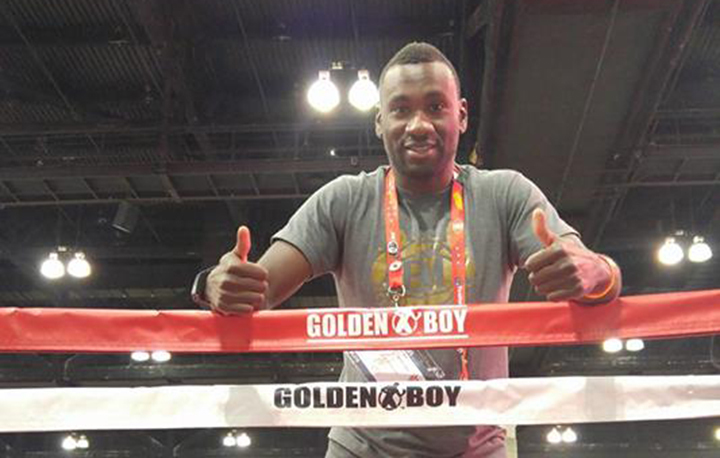 For the second time, Maxime competed in two sports (boxing and basketball), but this time at the international level. He won a silver medal in boxing, and his basketball team was eliminated before the medal round. For Maxime, competing in these Games is about more than just winning and medals, it’s about the indescribable atmosphere of camaraderie at the events. Participating in these events has allowed him to meet peace officers from five different continents. He has met men and women of various origins, ethnicities, religions and languages, strengthening his love of diversity and inclusion. Maxime has had to sacrifice in order to participate in these events, especially in boxing, where the training is very demanding. There are also all the travel-related costs. Despite these inconveniences, Maxime is proud of what he has accomplished because he believes that these sporting and human experiences are worth it. They also inspire young people and encourage them to overcome challenges and accomplish great things. In addition to his achievements in sports, Maxime cares about the well-being of his community and is involved with underprivileged youth. For example, in 2014, he started his own non-profit organization, Parrain VIP, which provided two disadvantaged athletes with the opportunity to participate in sport development camps. He also acts as a mentor to young athletes in need, teaching them good values. In August 2016, he helped organize an activity to inaugurate a new basketball court for young residents of low‑income housing. This event was part of an initiative carried out by the Québec police force aiming to connect with ethnocultural communities in the area. Since 2014, Maxime has been part of the As de Québec, a basketball team of police officers and correctional officers who also compete in the World Police and Fire Games. Every year, the team offers free basketball clinics to high school students who have integration, learning and behavioural difficulties. Moreover, in March 2017, he invited six disadvantaged youth from various ethnocultural communities to attend a boxing match to raise money for charitable organizations in the Québec area, an event that generated $11,500 in profits and educated young people on the importance of perseverance, mutual assistance and generosity. Ever since he joined the Correctional Service of Canada, Maxime has been a shining example of integration for ethnocultural employees. Starting in 2011, he participated in several activities to recruit members of employment equity groups as an official member of the Employment Equity and Diversity Committee and the CSC Speakers Bureau. As part of these activities, he promotes various actions being taken by the Correctional Service of Canada and the Public Service to create a working environment free of prejudice and discrimination. In January 2017, he became a Diversity and Cultural Competency Training instructor. This training covers several topics associated with ethnocultural offenders, members of employment equity groups, diversity and inclusion. More recently, in March 2017, Maxime was invited as a main guest speaker to a post-secondary institution in the Québec area. During that event, he explained the benefits of having grown up in Quebec and in such a multicultural environment. Maxime is also a great source of inspiration for the staff at the Donnacona Institution as well as for ethnocultural offenders. Through his role, in addition to welcoming offenders and participating in their discharge process, he is responsible for purchasing personal effects for these offenders. In fact, he developed the list of specialized personal care products for ethnocultural offenders. He also takes the time to educate offenders eligible for release on the importance of being a positive role model for their community and the impact of their actions on the image of their community. In February 2017, as part of Black History Month, Maxime organized a contest for the entire staff at the Donnacona Institution. Participants had a chance of winning a pair of tickets to the “Gala d’excellence Afro-antillaise”, an event showcasing the excellence of members of the black community in the Quebec area. Maxime has become an excellent representative of the CSC’s values, which are essential to an open and inclusive society. He was the happy recipient of the 2016-2017 Emerson Douyon Multiculturalism Award, which CSC awarded him for his contributions to ethnocultural communities and for all the work he does for the youth in his community.